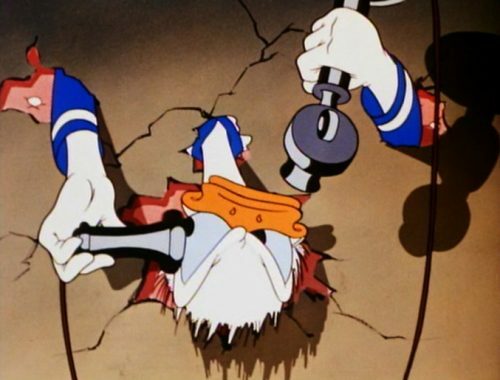 You are here: Home » Is Donald Duck suffering from PTSD? It’s the second time I have talked about our favourite duck. Donald Duck. The last time was about his eating habits. This time it’s about his state of mind and if he is suffering from PTSD, Post Traumatic Stress Disorder. If he is, then a good cause would be his time as a paratrooper in the Second World War. 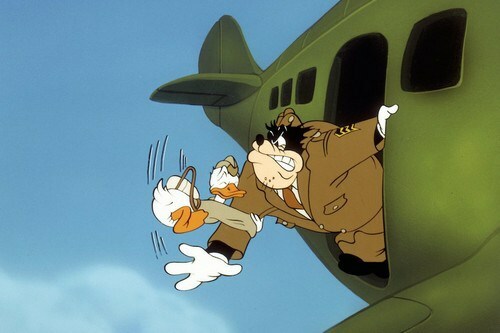 He was there, along side some of his other cartoon friends, fighting the Nazi threat. Having strange dreams of working for the Nazis. This could be thought of as being related to the events that he saw whilst being in the US Army. Possibly because of something he did, or didn’t do to save people. We have to take a stab at what the main trigger was. The best guess would have been what he saw whilst fighting. Some of the gruesome things he must have seen in that time. TO quote from one of the pages I found experiencing repeated or extreme exposure to aversive details of the traumatic events. Other things that may indicate this problem is his habit of snapping into a rage with, what seems to be, no trigger in his surroundings. Could this be something that we haven’t seen, or a trigger that we miss as we’re not paying attention to his state of mind? Could this be his method of reacting to the trigger events? Not only does he have strange dreams of living under the Nazis [ Der Fuehrer’s Face ]. He has been both suicidal as well as having difficulties sleeping. All the information I have read for this post, it does seem that he does show enough signs to make a reasonable diagnosis that is he is suffering from PTSD. We can’t track the original cause as his, full, war record has been lost over the years. We only know what Disney has allowed us to see. It could have helped to talk to someone about what he saw. He is of the generation who didn’t talk about what he saw. Something that is done today as the problem is a lot better known. Somebody trained would be the best person but he could have talked to his old comrades about what happened could have been useful. This has been written by a layman so don’t take anything as red. If you disagree then please comment below.